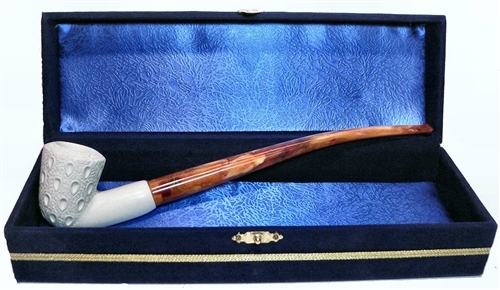 Standard Dublin Lattice Churchwarden Meerschaum Pipes with Velvet Chest - These pipes are made with Turkish Meerschaum and other natural minerals. This Royal Meerschaum Exclusive™ pipe is hand finished and provides a cool, dry smoke. It is a great pipe for beginners as well as for experienced pipe smokers. Each pipe comes with a detachable stem for easy cleaning, and with the universal fitting, each pipe can be smoked with either the Churchwarden size stem or a Regular size stem. The bowl is guaranteed to never burn out as what happens with some wood or Briar Pipes. 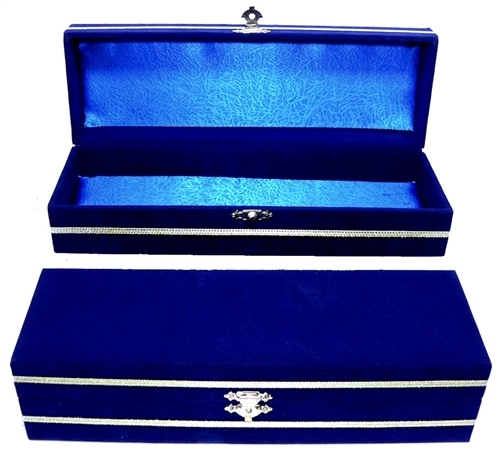 The Blue Velvet Chest is Fully Lined with Solid Brass Fitting. Hand made in Turkey, this box is ideal travel or home or office. Its padded bottom keeps your special pipes or other keepsakes well protected and the decorative gold trim gives a finished classy look. The Large Chest fits any of our Churchwarden Meerschaum pipes. 9.7" x 3.1" x 2.4"